Citation Information: J Clin Invest. 2019. https://doi.org/10.1172/JCI125534. Opioid use disorder (OUD) is associated with the emergence of persistent negative emotional states during drug abstinence that drive compulsive drug taking and seeking. Functional magnetic resonance imaging (fMRI) in rats identified neurocircuits that were activated by stimuli that were previously paired with heroin withdrawal. The activation of amygdala and hypothalamic circuits was related to the degree of heroin dependence, supporting the significance of conditioned negative affect in sustaining compulsive-like heroin seeking and taking and providing neurobiological insights into the drivers of the current opioid crisis. Citation Information: J Clin Invest. 2019. https://doi.org/10.1172/JCI124194. Citation Information: J Clin Invest. 2019. https://doi.org/10.1172/JCI124694. Neurofascin-155 (Nfasc155) is an essential glial cell adhesion molecule expressed in paranodal septate-like junctions of peripheral and central myelinated axons. The genetic deletion of Nfasc155 results in the loss of septate-like junctions and in conduction slowing. In humans, IgG4 antibodies against Nfasc155 are implicated in the pathogenesis of chronic inflammatory demyelinating polyneuropathy (CIDP). These antibodies are associated with an aggressive onset, a refractoriness to intravenous immunoglobulin, and tremor of possible cerebellar origin. Here, we examined the pathogenic effects of patient-derived anti-Nfasc155 IgG4. These antibodies did not inhibit the ability of Nfasc155 to complex with its axonal partners contactin-1/CASPR1 or induce target internalization. Passive transfer experiments revealed that IgG4 antibodies target Nfasc155 on Schwann cell surface, and diminished Nfasc155 protein levels and prevented paranodal complex formation in neonatal animals. In adult animals, chronic intrathecal infusions of antibodies also induced the loss of Nfasc155 and of paranodal specialization and resulted in conduction alterations in motor nerves. These results indicate that anti-Nfasc155 IgG4 perturb conduction in absence of demyelination, validating the existence of paranodopathy. These results also shed light on the mechanisms regulating protein insertion at paranodes. Citation Information: J Clin Invest. 2019. https://doi.org/10.1172/JCI124853. Carrying the ε4 allele of the APOE gene encoding apolipoprotein E (APOE4) markedly increases the risk for late-onset Alzheimer’s disease (AD), in which APOE4 exacerbates the brain accumulation and subsequent deposition of amyloid-β (Aβ) peptides. While the LDL receptor–related protein 1 (LRP1) is a major apoE receptor in the brain, we found that its levels are associated with those of insoluble Aβ depending on APOE genotype status in postmortem AD brains. Thus, to determine the functional interaction of apoE4 and LRP1 in brain Aβ metabolism, we crossed neuronal LRP1-knockout mice with amyloid model APP/PS1 mice and APOE3–targeted replacement (APO3-TR) or APOE4-TR mice. Consistent with previous findings, mice expressing apoE4 had increased Aβ deposition and insoluble amounts of Aβ40 and Aβ42 in the hippocampus of APP/PS1 mice compared with those expressing apoE3. 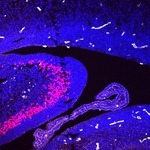 Intriguingly, such effects were reversed in the absence of neuronal LRP1. Neuronal LRP1 deficiency also increased detergent-soluble apoE4 levels, which may contribute to the inhibition of Aβ deposition. Together, our results suggest that apoE4 exacerbates Aβ pathology through a mechanism that depends on neuronal LRP1. A better understanding of apoE isoform–specific interaction with their metabolic receptor LRP1 on Aβ metabolism is crucial for defining APOE4-related risk for AD.